The life time for nuclear icebreaker Arktika is extended to 175,000 hours. The service time for other icebreakers can be prolonged up to 200,000 hours. Life time extension implies replacement and testing of the equipment allowing the safe operation of a nuclear icebreaker and its nuclear installations. Prior practise limited service time to 100,000 hours. Arktika, however, has already worked 142,000 hours – 42,000 hours more than the world’s first nuclear powered icebreaker Lenin. 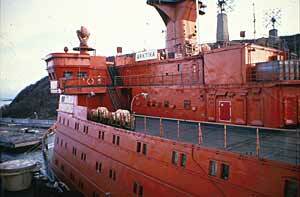 This icebreaker is currently being under reconstruction to become a museum of the Russian nuclear icebreaker fleet. The service time of the rest of the Russian icebreakers does not exceed 90,000 hours. Their further operation until 2004 will lead to a situation when Russia will be left with 3-4 icebreakers in service out of seven operating today, says Vyacheskav Ruksha, general director of Murmansk Shipping Company, or MSCo. The company operates the nuclear icebreakers fleet. There is little hope for commissioning of nuclear icebreakers of a new generation. Baltic shipyard in St. Petersburg has been working on construction of nuclear icebreaker 50 Years of Victory for 9 years. It is, however, required not less than $90 million to complete the construction while the price tag for Arktika’s service time extension would be just $4 million. Ruksha believes that the service time for the other nuclear icebreakers will be gradually prolonged as well. This will allow the nuclear ships to operate in the Arctic until 2012. “And this is still not the limit,” Mr. Ruksha emphasised. On May 17, a conference took place onboard Arktika with participants from all agencies, involved in design and operation of nuclear icebreakers. The conference participants said that the life time of the Russian icebreakers can be prolonged to 175,000 hours. The participants would neither exclude the possibility to extend service time up to 200,000 hours in the future, increasing the life time of the nuclear icebreakers from 25 till 30-35 years.